This guide is the first things you must read immediately after you join us. At a formidable 200 pages, this step-by-step guide will bring you up to speed on everything you need to know about exercise, supplements and dieting. How to structure your diet to keep fat gain to an absolute minimum — so you can focus on muscle gain and not have to worry about gaining fat. What supplement combination you MUST take immediately after your workout to speed up the muscle building process. How many calories you should be consuming to gain muscle. Exactly how much protein, carbohydrates and fats you should be eating each day to maximize your muscle-building efforts. How to spice up your meals with my simple recipes and sauces (especially for people who seek the convenience of a quick meal). Which "fast food" (not "fatty food") choices are best for muscle gain, particularly when you are pressed for time. 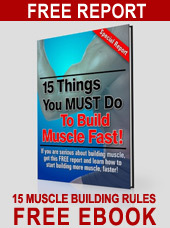 The best time to eat to gain maximum muscle and minimum fat. The best way to train for gaining mass (no, I'm not talking about exercises but the manner in which you conduct your training). What exercises to avoid when training to gain mass — don't even start thinking about any kind of training until you read this first! The best workouts for gaining mass (you're going to be amazed when you learn how simple yet powerful these workouts truly are). How to do the calculations to construct your own personalized diets that are custom-tailored to meet your needs and your weight-gaining goals. The proper way to measure your body fat. How to measure and convert food quantities in order to properly calculated your calorie intake, which you absolutely need to know. "...I wanted to say thank you for being the first person, that I know of, to have a program dedicated to skinny men. I read your whole book the first day and found it to be very informative and full of substance. As you know, a lot of books advertise to be "The Guide" but never live up to the hype. Not so with your book, it cuts through the fat in gets right in to the heart, which is gaining weight and muscle mass. 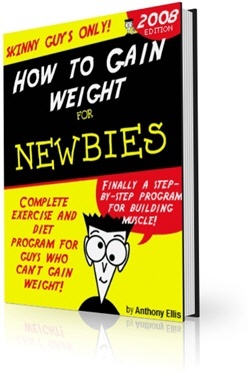 I have also found your book to be the best guide on the market when it comes to the specifics of weight training and gaining weight." ...For more testimonials, click here. The Beginner Tutorial 101 is the first part of the Gaining Mass! program. The second part consists of 24 weeks of muscle building workouts and weight gain diets. Members, please click below for additional tutorial articles and content. There is no ONE specific reason why you can't gain weight like everyone else. It varies from person to person, but for the majority of us, the problem is GENETIC. 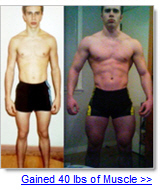 Genetics control your body type and frame. Genetics control your metabolism. Genetics control your muscle fiber make-up, and they also control how big and strong you can actually get without steroids. Hormones are chemicals produced by your body for many different purposes. Some build muscle, while others breakdown muscle. Some burn fat, while others store it! We need to learn about them so that we can find ways to increase the muscle building and fat loss hormones, and decrease production of the muscle wasting and fat storing hormones. Our muscle building programs were not meant to be added to any other training routine you may already be doing. Especially those training, or competing in other sports. This is mainly because when you are competing or training in a sport, all of your training and dieting should be focused on enhancing your performance for that sport. Our programs are only to help you gain weight. They may or may not enhance your sports performance. Why Must Hardgainers Use Low Reps? For anyone trying to gain muscle, you must train with heavy weights. By heavy, I mean a weight that is challenging for YOU. How Weight Lifting Stimulates Strength and Muscle Growth? When you train with weights, your body adapts to the stress primarily in the nervous system and in the muscles. This adaptation is known as the SAID principle. SAID stands for "Specific Adaptation to Imposed Demand." It simply states that your body will adapt in very specific ways to the stress imposed upon it. As we all know, most people walk around dehydrated. Whether they realize it or not, 75% of Americans are chronically dehydrated. Many experts recommend drinking more water to help lose fat, but no one ever really says why. They alway say that the water "flushes out the fat". Well, that's not exactly what happens. I think the most common question that I get is, "will drinking too much hurt my results", and I usually want to yell at the person who asks this question, because they already know the answer. OF COURSE! � 2007-2012 Genos. All Rights Reserved.